Underground fuel storage (UST) monitoring is a critical part of fueling operations for both commercial fueling and retail fuel operations. The creation and monitoring of tank and fuel sump alarms is critical to ensuring environmental safety and EPA regulation compliance. As a leader in both tank gauge technology and alarm monitoring, InSite360 leverages both Veeder-Root ATG and FuelQuest experience to ensure fuel storage tank alarms are quickly resolved. The monitoring of gasoline, diesel and kerosene fuels helps fuel wholesalers and retailers improve their business. 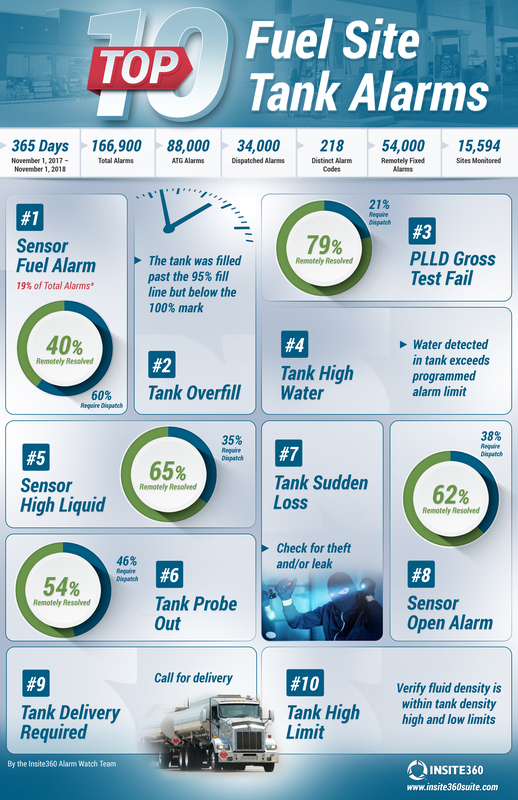 In analyzing over 160,000 alarms from over 15,000 fueling sites across the U.S., we have developed this list of the top 10 causes of UST tank and ATG gauge alarms. A proper alarm management program can ensure rapid response to fuel related environmental risks while also avoiding unneeded service technician calls. A Sensor Fuel Alarm indicates that a fuel tank or line sensor located in a containment area is sensing a liquid, generally gas, diesel or water. 40% of these ATG alarms are remotely managed and resolved, because investigations identify local events like water intrusion due to rain, which is a common trigger for this alarm. If the alarm cannot be resolved remotely, an authorized service technician will be dispatched to investigate the cause of the alarm and the integrity of the fueling system. A Tank Overfill alarm alerts that the gasoline or diesel level in a storage tank has reached or exceeded a pre-programmed threshold of the tanks capacity, usually 95% and the tank is in immediate danger of overfilling. Typically, this alarm also triggers an automatic shutoff to prevent spillage and this alarm is very likely due to a delivery either in progress or recently received. Most of these alarms can be remotely resolved by stopping the delivery in progress and preventing the tank from being overfilled. A PLLD (Pressurized Line Leak Detection) Gross Test Fails indicates that the line leak detection system has detected a line leak in excess of 3 gallons per hour. This alarm will also generate a SHUTDOWN ALARM if the system is programmed to shut down dispensers on a gross line fail. This is a critical condition that must be addressed immediately and 21% require a dispatched technician; however, 79% were remotely resolved by the Insite360 remote fuel management alarm team. A Tank High Water alarm identifies that the water probe has risen and reached the “High Water Limit” preprogrammed threshold. Because the water level exceeds the limit, water must be removed from the tank. 86% of these alarms are resolved remotely once the level is assessed while 14% require a truck roll. A Sensor High Liquid alarms indicates that the monitored parameter in a tank’s interstitial reservoir or containment area has exceeded the preset threshold. 65% of these alarms are resolved remotely whereas 35% require a dispatch to evaluate the tanks at the c-store, hypermarket or commercial fueling site. A Tank Probe Out alarm displays that the probe has failed to provide a tank level reading (inventory) or the reading is unstable. Generally, this is flagged as a hardware failure caused by the probe itself and/or wiring into the console. 54% of these alarms are resolved remotely with 46% requiring an authorized service technician be dispatched to the gas station. A Tank Sudden Loss alarm warns that the in-tank ATG probe has noticed a decrease in fuel level beyond the programmed threshold during an idle period. This alarm can be indicative of a fuel leak or of fuel theft. 85% of these alarms are handled without dispatching a technician; however, the cause of fuel loss should be investigated. A Sensor Open Alarm indicates that a probe sensor has stopped communicating to the ATG after being activated. The pressure sensor reading is less than -8 psi (-55.16 kPa) and it can only be tested while the gas pump is running. When this alarm occurs, the gas pump stops dispensing if the site manager has programmed the Veeder Root TLS 450 or TLS350 ATGs to do so. A Tank Delivery Required indicates that the fuel level in the fuel tank has reached a pre-programmed threshold level based on the gas station’s need of a gasoline or diesel delivery. This level is set based on the size of the underground storage tank and how many gallons the site sells. A Tank High Limit alarm is an environmental compliance setting that shows that the product density in the tank has reached a pre-programmed threshold usually 90% of tank capacity and indicates a danger of overfilling your tanks. This threshold should not be exceeded to ensure that there is not accidental spillage.